Somerset & Dorset railway branching off to the left, heading for Bournemouth. Bath Green Park Station was previously known as Bath Queen Square and not as Bath Queen Park. 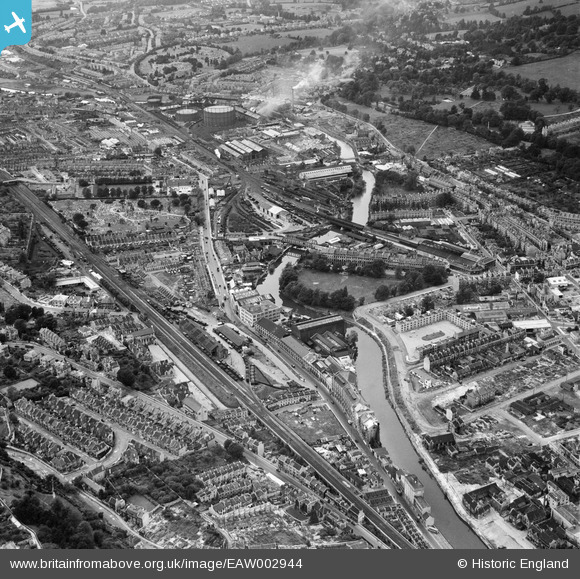 This photograph is useful in showing some of the devastated areas of Bath following the Baedeker Raids of 25/26 April 1942. As an example I could not believe my eyes when I saw the complete destruction of a little street which I remember personally from the 1950's. Victoria Road must have been completely rebuilt. What a resource for railway modellers! 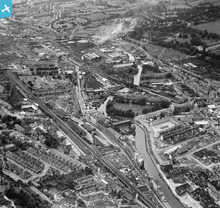 This photo will be of enormous interest to most railway enthusiasts as it shows the goods yards, engine sheds and Bath Midland Station just before nationalisation.